Clack! game: Magnetic pattern-matching game. 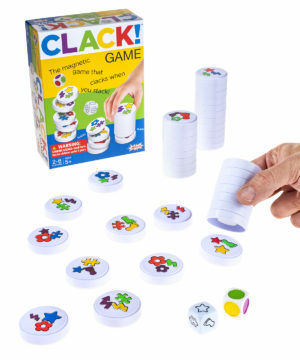 Clack is a pattern-matching frenzy with rules simple enough for kids just learning, but that's still fun for all ages. In this game, all players are racing against each other to gather up the collective tiles and make the biggest stack. One player rolls the dice to determine the color and shape you're looking for, and then it's everyone for themselves as you find all the pieces that match. Since each disc contains a magnet in the middle, picking up a match comes with a satisfying clack! Once all of the pieces have been collected, see who has the tallest stack to find out the winner!